Most basement water problems are caused from water getting inside through porous concrete, or through cracks in the foundation wall. To determine whether or not you have these problems, the first thing you should do is inspect the concrete in and around your home. Areas of spalled concrete will have areas that are flaky, brittle, and sometimes these damaged areas may even resemble a honeycomb. This is why a porous concrete problem is sometimes referred to as "honeycomb" concrete. Make note of any damaged areas you find. Next, you will need to check for wall cracks. Carefully look on the interior of your home in the basement. Cracks could be at the top, middle, or bottom of the foundation wall, and they could be in vertical, horizontal, or stair-step patterns. Next, you will need to look outside of the home. This includes looking above-grade and below-grade. Once you have completed your above-grade inspection, you will need to do a little digging to check for cracks below the soil. If you find one, don't stop your search. Typically speaking, when there is one crack, there will be more. Some things could fool you into thinking you have found a crack, and this includes form lines that are vertical lines that are shaped by the original wood forms that were used during the time when your foundation was first being built. These are not cracks and shouldn't be treated as such. If you can't find any cracks, and cannot locate the source of the leak in your basement, then it is time to call in the professionals for assistance. Surface water: This includes water from run-off, rain, melting snow, drainage on the lawn, poor yard grading, and so on. This water problem is typically limited to effecting the first four feet of soil. 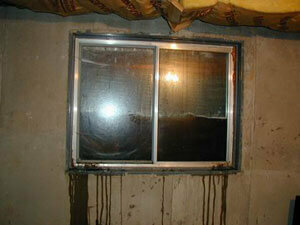 This is often seen in homes that have exterior waterproofing problems. Ground water. This comes from high water tables, poor soil conditions, springs, lakes, and so on. 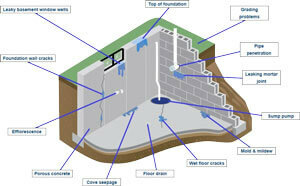 This problem can extend down below the basement floor, and this is also known as an exterior waterproofing problem. Other water. This includes all other sources of water, such as condensation from temperature changes, plumbing leaks inside or outside of the home, and so on. This is known as an interior waterproofing problem. Next, you will need to determine when you notice the leaks. Do you only see water in the basement after a heavy rain? Do you notice any leaking pipes or backed up floor drains under your home? Being able to answer these questions will help you to better understand the solution to the problem. Dampness on rugs, carpets, or floor coverings. This can indicate that there have been leaks in the past. Make note of the areas where the moisture is felt. Efflorescence. This is a white, flaky, and chalky substance that is often seen on basement walls when water is present. Often, it indicates water is getting in through the wall in certain spots. Mold growth. Mold only can grow when moisture, humidity, and organic materials are present. If this is seen growing in your basement, you have a leak somewhere. Rust stains. Rust stains on the floor, walls, or on appliances is a good indication that water was once in the area. Stained or damaged wooden materials. Wood that is rotting, warped, darkened, or stained is an indication that water was absorbed in the past. Dampness or water puddles on the floor. This is a good indication that there are floor cracks in your basement that are letting seepage into the home. Water bugs. These bugs will appear in corners or along baseboards where moisture is present. 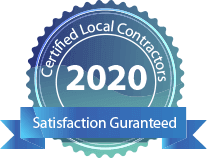 After you have figured out the answers to your above questions and have made note of any of the warning signs of a basement leak, you will need to get in touch with a professional waterproofing contractor.